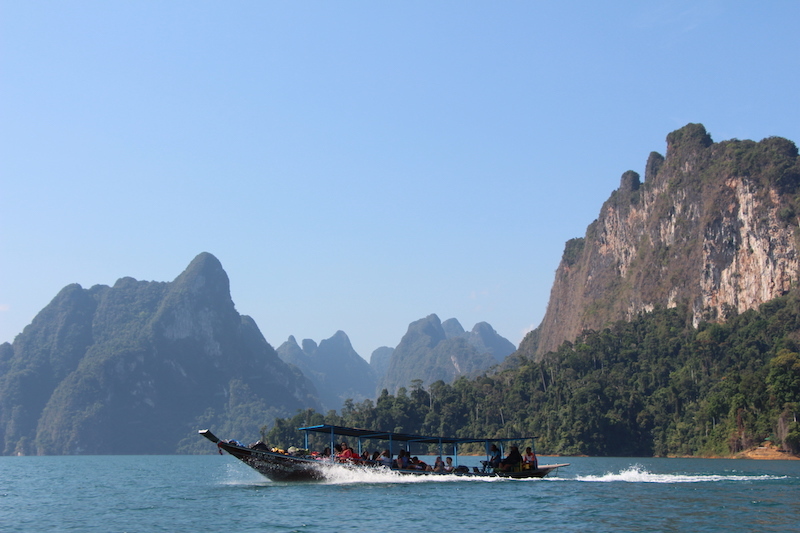 Our “Khao Sok Explorer” offers the perfect wet, wild and wonderful long-weekend getaway for students, teachers and family groups. 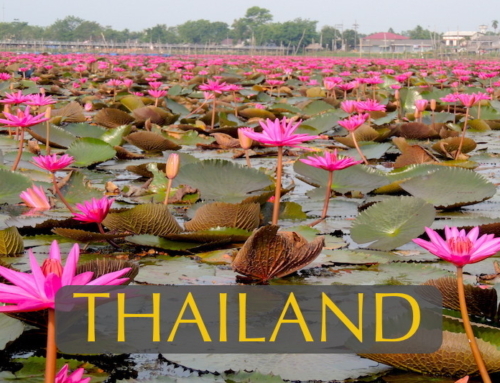 This 3-day, 2-night study adventure can begin at Phuket, Krabi or Suratthani airports in southern Thailand, or at Surattthani train station following the overnight (sleeper car) train trip from Bangkok. This is the quintessential study trip, combining stunning scenery, great wildlife viewing, recreational sports, as well as opportunities to advance science and share in the thrill of a real “Indiana Jones’ adventure. 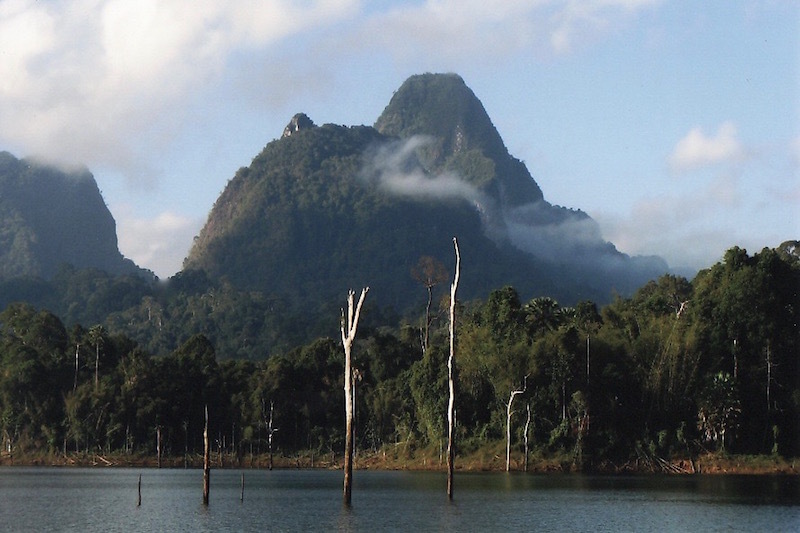 Khao Sok National Park in the South of Thailand is part of the largest protected region between Bangkok and Singapore; it supports overlapping species from two distinct biological zones. Here students will have a chance to help map keystone species (hornbills, gibbons and giant fruit bats) as part of an on-going base line data project. 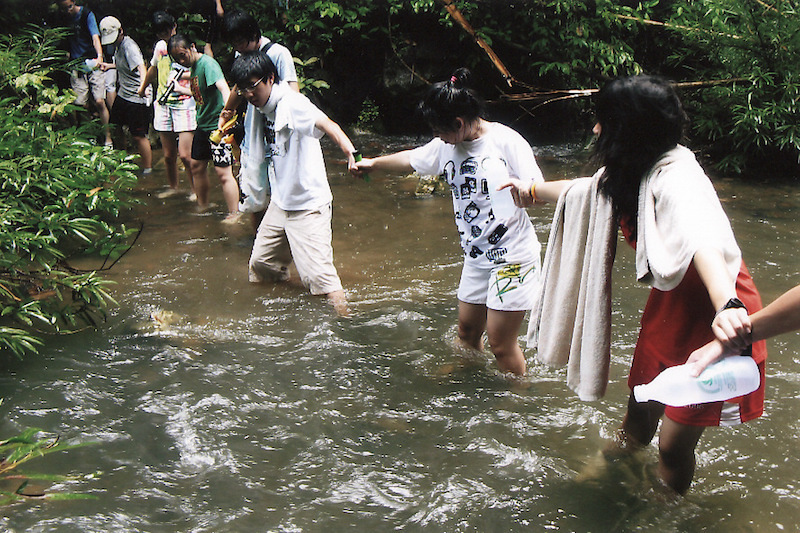 They will explore two caves, learning about the geology as well as flora and fauna of cave ecosystems. 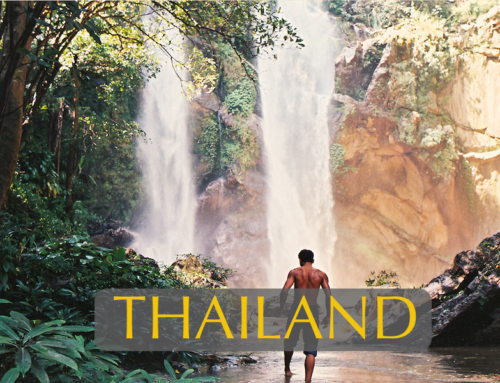 They will trek through a tropical evergreen forest, share in a jungle lunch of forest foods cooked in bamboo over an open fire, and kayak down the lovely Sok River through towering karsts that rivals any landscape in the world for scenic beauty. Floating raft houses will provide simple but fun accommodation for this most popular of all our ‘Wet, Wild & Wonderful’ weekends. Adventures include: wildlife viewing by boat in one of the world’s most spectacular karsts landscapes, kayaking the lovely Sok River, a Night Safari by boat under the stars, plunging into a jungle lake from the porch of your private floating raft house, trekking through an unspoiled rainforest, and exploring two dramatic caves – one a real Indiana Jones adventure! Wildlife opportunities abound as students focus their outdoor studies on cave, river, lake and tropical forest ecosystems. 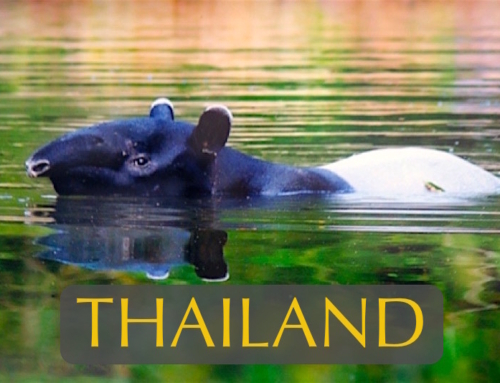 Environmental and community service projects include trail clearing and cleaning, conducting a census of Khao Sok’s keystone species – hornbills, gibbons and giant fruit bats, and visiting a local school to donate environmental education materials that encourage conservation. 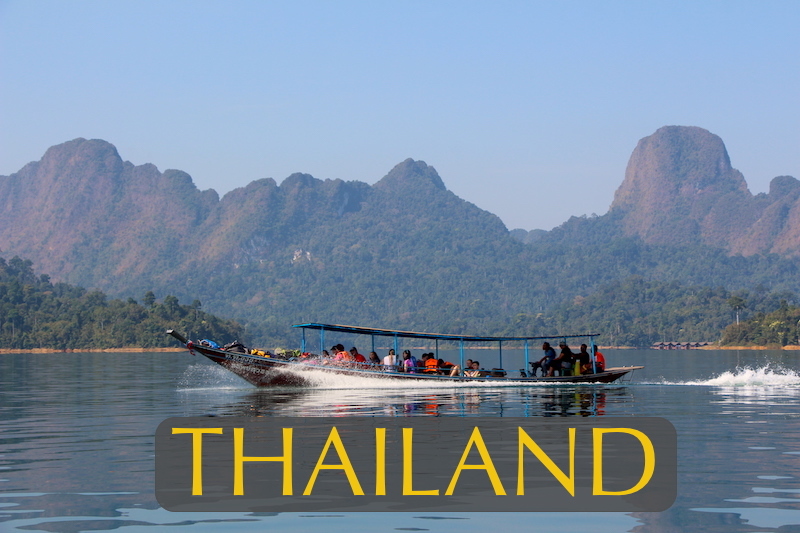 Meet at airport (or Suratthani train station) and transfer by bus/mini vans to Cheow Lan Reservoir, Khao Sok National Park for a group orientation. Even on nights where wildlife are not particularly active, we will enjoy wonderful night orchestrations of frogs, katydids and crickets, as well as have great opportunities to study the constellations in the night sky (weather permitting). Everyone’s up early to view a spectacular sunrise and enjoy a snack of banana bread and hot chocolate (or coffee) before departing on our Dawn Safari. 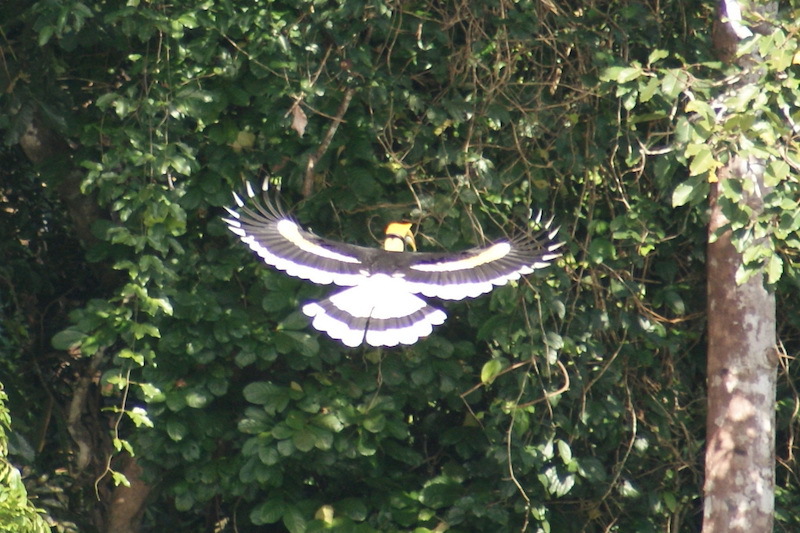 Armed with binoculars, maps and note books, we survey the lakeshore in search of hornbills and their nesting sites, as well as Lar gibbon families. This census is the first ever conducted at Khao Sok, and provides an important bench mark for monitoring impacts on wildlife from poaching. Wildlife sightings during Dawn Safari usually include: several species of hornbills, Lar gibbons, Dusky and Silver langurs, Long-tail macaques, Pig-tail macaques, White-bellied sea eagles, Osprey, Lesser fish eagles, mynas, Greater coucals, Jungle fowl, Chinese pond herons, kingfishers and a wealth of songbirds. Returning to our raft house for breakfast we then have several hours for formal studies, swimming, and kayaking before our afternoon adventure begins. We set off by boat before noon to cross the vast lake to the trail head to Namtaloo Cave, and begin a 2-3 hour study trek through primary tropical forest. Along the trail we will stop to learn about liana vines, bamboo, giant tree buttresses, termite mounds, fig tree pollination, and many other lessons. 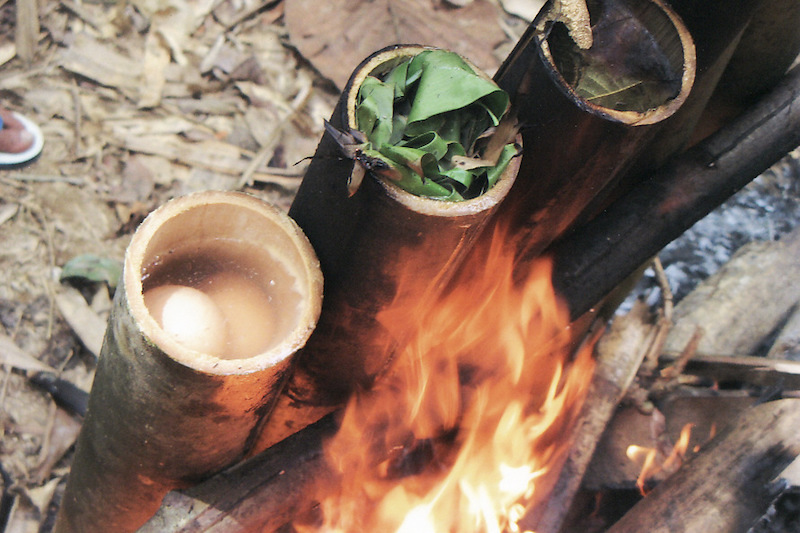 Weather permitting, there’s the option of preparing our lunch “forest dweller” – style. This requires folding rice into leaves, cutting bamboo, building a fire and steaming our food inside sections of bamboo. Returning through the forest to our boats, we set off for Tone Tuey Raft House for a clean up and some well deserved refreshments. We then boat back to Kraisorn Raft House during the sunset, stopping along the way to witness the spectacle of tens of thousands giant fruit bats setting off from their tree roosts on their nightly feeding forays. Dinner is followed by a wonderful evening of shadow-puppet theatre. Student teams will use a wide range of animal puppets to create and present their own shows. 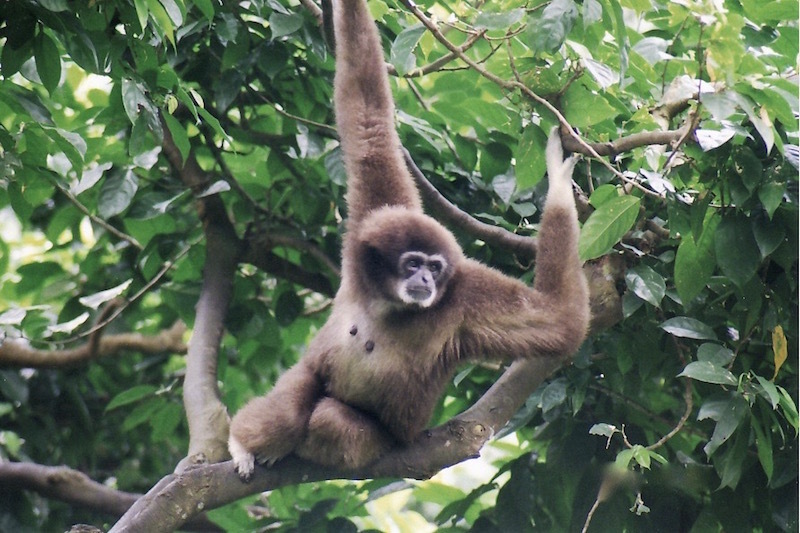 A closing ceremony for our final night together will highlight each participants special accomplishments, and award them with a wildlife patch should they choose to become a gibbon, hornbill or giant fruit bat “guardian” for life. There’s time for another Dawn Safari for early risers, before we pack up, eat breakfast, and head back across the lake by boat to our waiting buses or mini vans. It’s less than an hour drive to our put in point on the Sok River where we will begin our kayaking adventure. Wildlife sightings along the shore might include: several species of kingfishers, fish eagles, frogs, songbirds, and possibly river otters. Following our paddle, we will conduct a study of the invertebrate life of the river, searching under rocks and bank ledges with dip nets. Charts of fresh water invertebrates will help student teams properly identify their discoveries as they compete against one another to find the most species. 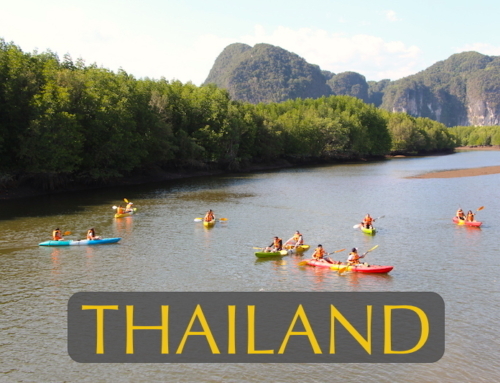 Following a big lunch at a riverside resort, we will set off by bus / mini vans for the return drive to Suratthaini, (Phuket or Krabi airports), or the Suratthani train station for homeward departures.